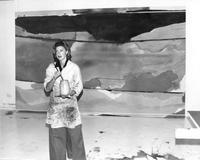 Frankenthaler Scholarships, in painting and art history for graduate students, awarded to Columbia University School of the Arts, School of the Art Institute of Chicago, UCLA School of the Arts and Architecture, Yale School of Art. Frankenthaler Prints Initiative, comprising gifts of selected prints and grants to develop related programs, awarded to Blanton Museum of Art at The University of Texas at Austin, Bowdoin College Museum of Art, University of South Florida Contemporary Art Museum, Grunwald Center for the Graphic Arts/Hammer Museum, UCLA, The Nasher Museum of Art at Duke University, Pennsylvania Academy of the Fine Arts, Princeton University Art Museum, RISD Museum, Rhode Island School of Design, SCAD Museum of Art, Savannah College of Art and Design, Spencer Museum of Art, University of Kansas, Lawrence. The Art Institute of Chicago, support for educational programs in connection with exhibition Helen Frankenthaler Prints: The Romance of a New Medium. Solomon R. Guggenheim Foundation, support of the exhibition Hilma af Klint: Paintings for the Future. Triangle Arts Association, operating support. Women Make Movies, support for a film on Pat Steir by Victoria Gonzalez Pena. Center for Curatorial Leadership, operating support. Film Forum, support for The Helen Frankenthaler Endowed Fund for Films on Art. Madison Square Park Conservancy, support for Summer 2017 Prismatic Park project. Skowhegan School of Painting & Sculpture, support for construction of new building for artist studios. University of Connecticut, support for the performance, recording, and production of Spiritualist (Concerto for Piano and Orchestra after three works by Helen Frankenthaler), by Kenneth Fuchs. Vermont Studio Center, support for Frankenthaler Fellowships for visual artists. Archives of American Art, support of oral history program. Association of Art Museum Curators, operating support. Brooklyn Museum, support for renovation of European galleries. The Dalton School, support for new visual art building. French-American Fund for Contemporary Art, operating support for Étant Donnés. Grey Art Gallery, New York University, support for exhibition titled Inventing Downtown: Artist-Run Galleries in New York City, 1952-1965. Human Arts Association, support for post-production of documentary film about artist Elizabeth Murray. Rose Art Museum, support of exhibition program. Storm King Art Center, support of exhibition program. The Aspen Institute, support for second-stage research on artist-endowed foundations. The Brooklyn Rail, support for "In Conversation" series for 2015-2017. Center for Contemporary Printmaking, operating support. Des Moines Art Center, support for exhibition titled East and Beyond: Frankenthaler and her Contemporaries. Dorsky Museum, support for exhibition titled Bradley Walker Tomlin. The Drawing Center, program support for "Open Sessions" series. International Foundation for Art Research, operating support. MIT List Visual Arts Center, support for Joan Jonas’s presentation for U.S. Pavilion at 56th International Art Exhibition La Biennale Venezia, They Come to Us Without a Word. Montclair Art Museum, support for exhibition titled Matisse and American Art. museum in progress and International Friends of the Vienna State Opera, support for 2015-2016 “Safety Curtain” project, by Dominique Gonzalez-Foerster. Yaddo, support for creation of new ''live-work'' studio for visual artists. Bennington College, support to establish Helen Frankenthaler Fund for the Visual Arts, to advance the study of the arts at Bennington in new ways. The Brooklyn Rail, support for publication, Come Together: Surviving Sandy, Year 1. The Foundation does not accept unsolicited grant requests.